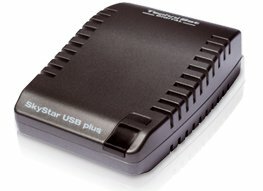 The TechniSat SkyStar USB plus is a compact USB 2.0 box for digital reception of television and radio programmes via satellite on your notebook or desktop PC. The dimensions of the titanium-coloured unit are only 10 cm x 7 cm x 2,5 cm (L x W x H). Its light weight ensures the SkyStar USB is the ideal companion when you are travelling. Apart from its external advantages, the SkyStar USB plus, in conjunction with the TechniSat TV Center software provides many more attractive features, such as a convenient programme for managing your favourite channels (100 memory slots each for your preferred radio and TV channels). In addition, the programme information service provides programme previews several days in advance. The personal video recorder function allows you to select, pre-programme and record your favourite programmes on hard drive. This feature means you need never again miss a programme you would like to watch. The video editing software EVE v2 provides comprehensive editing functions for the programmes you have recorded (removing advertising, adding special effects, DVD burning function, and many more). Additional features include videotext, the timeshift function and the sleep timer.